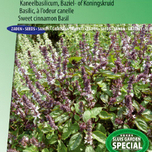 Want to order herb seeds online? More and more garden enthusiasts experience the convenience of buying their garden seeds and bulbs over the Internet. And why not? After all it is great to be able to be busy all day in the garden and to order your garden seeds in the evening online. Our webshop Seeds4garden offers you the largest assortment of flower, vegetable, and herb seeds, of the best quality and at competitive prices. The sowing and harvesting times for each product are stated on the website and on the packages you will find extensive sowing instructions. Even for the inexperienced gardener success is guaranteed! Herb seeds for the loveliest herbs from your own garden! What is so nice about herbs is that they are happy in a small space in the sun and also mostly thrive in a hanging basket or pot. Never mind how small your garden or balcony is: you can always garden to your heart’s content with herb seeds! What do you think of a big pot with chives, parsley, or basil to give your salads that extra touch? Or the lovely smell of thyme or oregano to use fresh in dishes and to dry later? Many herbs also have the most beautiful flowers, just think of aniseed, camomile, and mint. So twice the enjoyment! Taking herb seeds with you for afternoon tea! Why not bring a nice assortment of herb seeds to a birthday! Bet that the person having a birthday is surprised when you arrive for ‘afternoon tea’ with herbal teas such as stevia, mint and lemon grass! Makes a change from the usual book voucher and the receiver will experience months of enjoyment when his/her herb seeds germinate and grow into lovely plants. Have a look at our website under ‘promotional gifts’, because your business relations will also benefit from such a ‘green’ gift. 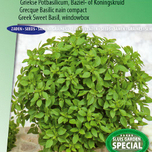 Buy the best herb seeds from www.seeds4garden.com! Kaufen Sie Ihr Krauter Samen mit rabat in unserem webshop!